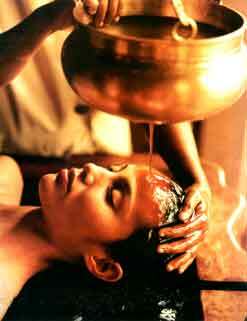 Shirodhara is a form of Ayurveda medicine that involves gently pouring liquids over the forehead (the ‘third eye‘). It was developed by vaidyas (practitionars of Ayurveda) in Kerala, India for use in sukhachikitsa (restorative therapy) and can be one of the steps involved in Panchakarma. The name comes from the Sanskrit words shiras ‘head’ and dhara ‘flow’. The liquids used in shirodhara depend on what is being treated, but can include oil, milk, buttermilk, coconut water, or even plain water. Shirodhara has been used to treat a variety of conditions including eye diseases, sinusitis, allergic rhinitis, greying of hair, neurological disorders, memory loss, insomnia, hearing impairment, tinnitus, vertigo, Ménière’s disease and certain types of skin diseases like psoriasis. It is also used non-medicinally at spas for its relaxing properties. There are specialized forms of shirodhara called thyladhara, ksheeradhara, thakradhara and jaladhara. Abhyangam is the Sanskrit word for oil massage in the ayurvedic system. It is prescribed as a daily routine in the ancient ayurvedic texts. It involves applying vegetable oils infused with herbal preparations on the body or particular parts of the body in a specific style to obtain the desired results.One of the easiest ways to bring ‘Vata’ under control is by regular ‘Abhyangam’ or oil massage. Hence, just like the life and strength of an earthen pot or a wheel is increased with regular lubrication, our body tissues get strengthened by regular application of oil. The person is let lay on his/her stomach on a massage table. A herbal paste is made into a cup with the skin of lower center back forming the bottom of the cup and the herbal paste its borders or walls. Medicated oil is poured into the cup and retained there. Back pain related to disc problems is cured this way. Pizhichil is a special form of Ayurvedic treatment that combines rich oil massage with a special heat treatment. This therapy is known as the “King’s Treatment” due to its popularity with the Maharajas of ancient India. During this indulgent treatment 20 liters of medicated and warmed Ayurvedic oil is continuously poured over the body while two practitioners rub and stimulate the skin using hands and special cotton cloths. The process is performed with the person both lying down and while sitting in a chair specially designed for the purpose of applying medicated oils. Navarakizhi is a perspiration-triggering body scrub.What makes this treatment different is the use of medicated herbal rice. To make these, rice in first soaked in natural herbs and oils. The blend is cooked to steam, and the resulting fragrant mixture is then contained in puffy muslin tea bags. The procedure in Navarakizhi is a two-step process: specially-applied oil is first slathered all over the body, after which the muslin tea bags are used to ‘pound’ the body, with extra focus in areas where marma (nerve points) reside. Navarakizhi is extremely effective against rheumatism, joint and muscle pains, back pains (e.g. sciatica, slipped discs), high blood pressure, high cholesterol levels, and sexual problems such as and menstruation, infertility and nervous weaknesses. It may also get rid of certain skin problems. Podikkizhi is a therapy in which the body of the patient is fomented with linen bags containing a mixture of horse gram, black gram, gingelly seeds and other vital ingredients in powdered form. The fomentation is performed in the same way as in navarakkizhi. The patient is seated on the droni with legs stretched when the fomentation begins. It is important that the Kizhi or linen bags should retain a constant temperature during the treatment. The seated position of the patient is followed by all other usual positions. Podikkizhi is effective for diseases arising from disrupted vata and pitta doshas. After fomentation, the patient’s body may be wiped clean with a towel.